(Newser) – A high school principal and two others were shot by a 17-year-old student in France Thursday, the AP reports. 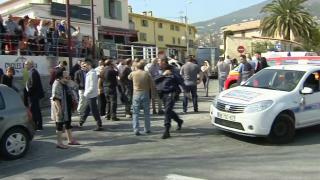 The shootings took place at the Alexis de Tocqueville school in the southern French town of Grasse. A police official says in addition to the three wounded in the shooting, five other people are being treated for shock. None of the injuries are life-threatening and all other students are now safe. The shooter has been arrested for possessing weapons. Just one cotton picking uno minuto S'il vous plaît. 1) no right to bear arms, 2) must have license for all firearm purchases, 3) must undergo background check and submit a form signed by a licensed psychologist before you can make the purchase. But the employees of Charlie Hedbo found out that restrictive gun laws make not lack of gun violence thereof. Just take my almamater. The Univ. of OU PIO said, "Well, this is the most perfect example of the campus gun ban working like it should." hold onto your horses Pocahontas. How did it work when the two incidents you referenced was when two different students went into Kauffman hall, both armed, and both injuring teaching assistants. Now one of them was nutbar Michael Joseph Childers who entered with a pistol, cracked the TA over the head with it, dragged her down the hall, and tossed her down 3 flights of stairs. So exactly how did the gun ban work in that situation? What if he was successful in doing what he had intended as his gun not jammed due to him hitting the TA on the head and it jamming the firing pin mechanism? Well, we would have had a dead TA instead of a severely crippled one. Now wouldn't it had been nice for a well qualified professor or staffer to have carried on those two fateful days and then shot either or both nutbar students like Michael Joseph Childers. Remember Childers wanted to kill the TA and his only fail in doing so was a jammed firing pin. "The incident, which does not appear to be linked to terrorism, comes with France on high alert after more than 230 people were killed in the past two years by attackers allied to the militant group Islamic State." Our democrats dream. "I just know the gunman by sight. He was gentle and low-key key, not a nasty guy." In other words, he's a psycho.